In a world where actresses turn fashion designers and fashion icons overnight despite the fact that the world knows they have stylists and are paid to look a certain way, it’s hard to decipher fashion sense from true style. I define fashion as a popular trend in dress. 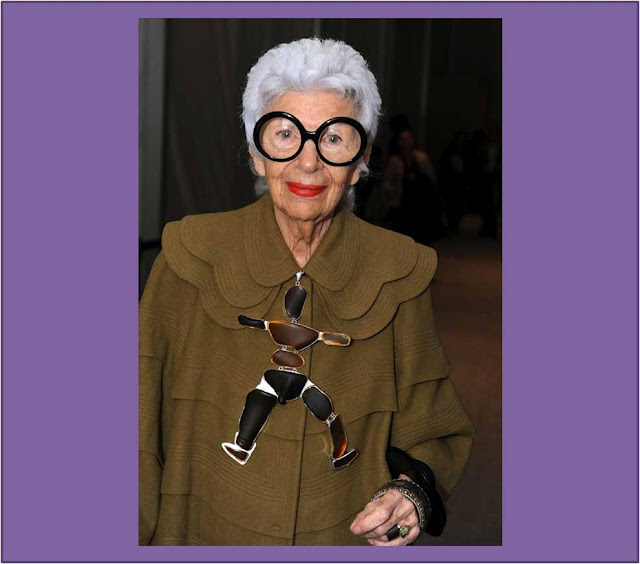 True Style is: The combination of distinctive features in relation to dress. 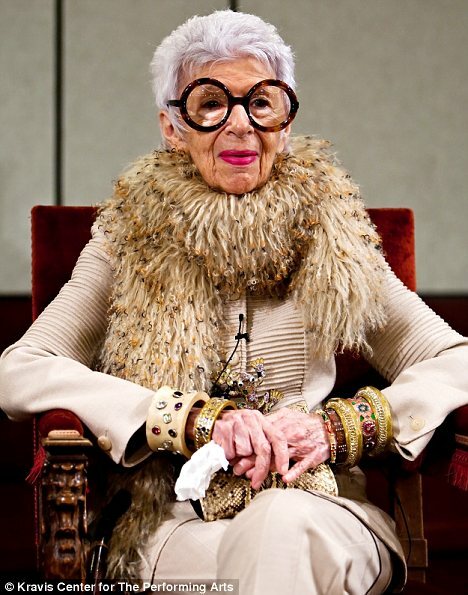 Through time, there have been many people who claim to have fashion sense but lack true style. There are those that can shop mannequins and all the latest trends but once they have to put the outfits together themselves, they struggle to leave their OWN mark on each look. To me someone who dresses themselves, shops for themselves and can dress in a striking, noteworthy way, embodies true style. When it came to picking my ultimate fashion icon it was difficult but one person stands out to me in terms of pushing the envelope before the envelope even existed. Trying the new and strange. Going for over-the-top. Creating a buzz. Always leaving her own mark on each look. Born Iris Barrel in Astoria, Queens, New York, Apfel is the only child of Samuel Barrel, whose family owned a glass-and-mirror business, and his Russian-born wife, Sadye, who owned a fashion boutique. She studied art history at New York University and attended art school at the University of Wisconsin. 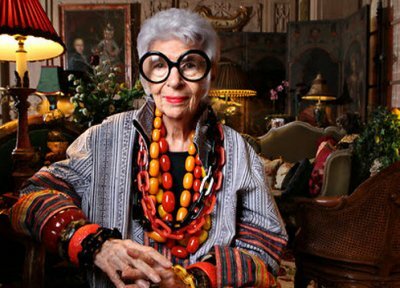 As a young woman, Apfel worked for Women’s Wear Daily and for interior designer Elinor Johnson. She also was an assistant to illustrator Robert Goodman. 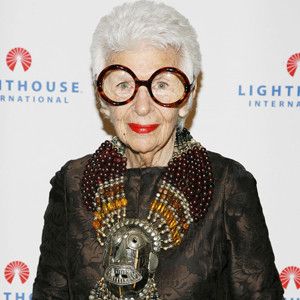 In 1948, she married Carl Apfel. Two years later they launched the textile firm Old World Weavers and ran it until they retired in 1992. 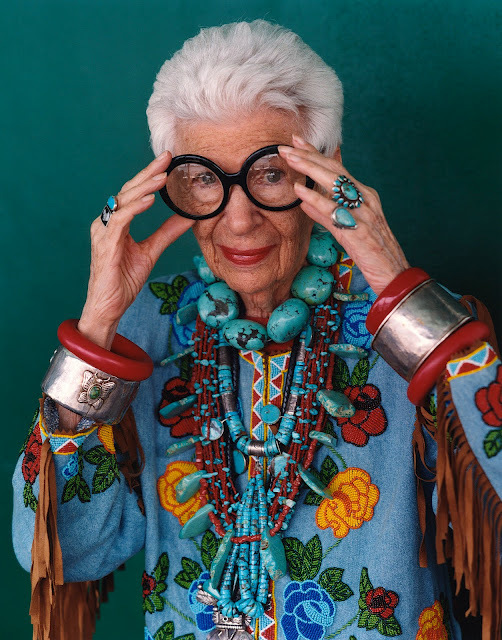 During this time, Iris Apfel took part in several design restoration projects, including work at the White House for nine presidents: Truman, Eisenhower, Nixon, Kennedy, Johnson, Carter, Reagan, and Clinton. 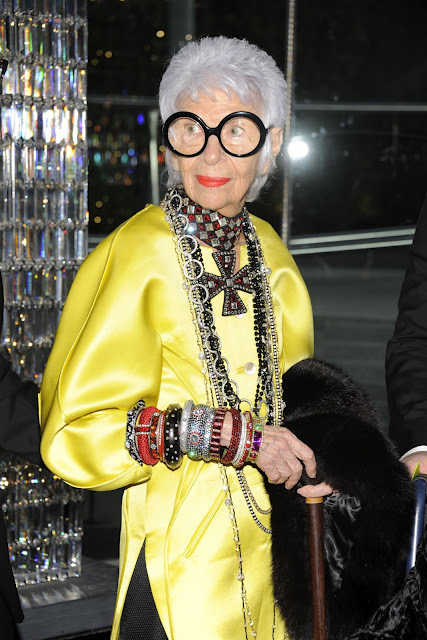 Iris incorporates her own twist on every look she donns. With attention to detail, layer upon layer of oversized baubles on her thin frame and who could ignore her signature bold round frames, Apfel has situated herself in the fashion world as a true icon. 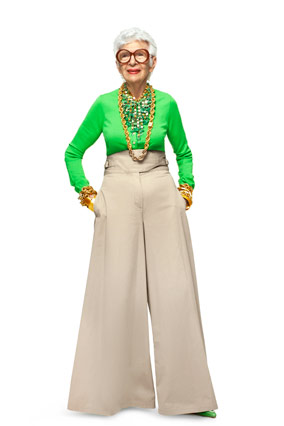 As one of the most vivacious characters, endemic to the worlds of fashion, textiles, and interior design over the past 40 years, she has cultivated a personal style that is both witty and exuberantly idiosyncratic. “Apfel chose to re-define herself during an era where a woman’s voice, as well as her irreverent style, was irrelevant,” said zeitgeistworld.